Finally, after seven years planning and cajoling, there is an interpretive sign outside the George Maxwell Memorial Cemetery. 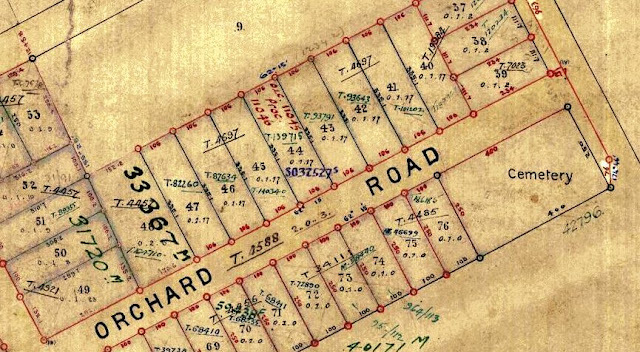 Back in 2002/2003, Lorraine Wilson, then Chairman of the Avondale Community Board, put forward a project for signs and plaques, as well as heritage bookles, for both Avondale and Blockhouse Bay. Well, things being as they are, the project got chopped up, redeveloped, evolved (put through the mincer at some point, I'm sure) and ended up being some small plaques along Avondale Mainstreet, along with a couple of signs on which they forgot to mention the Avondale-Waterview Historical Society until I kicked up a fuss. The third sign, which was supposed to be outside the cemetery, was dropped off, to my annoyance. Then, in April 2010, along came Mayor Bob Harvey of Waitakere. 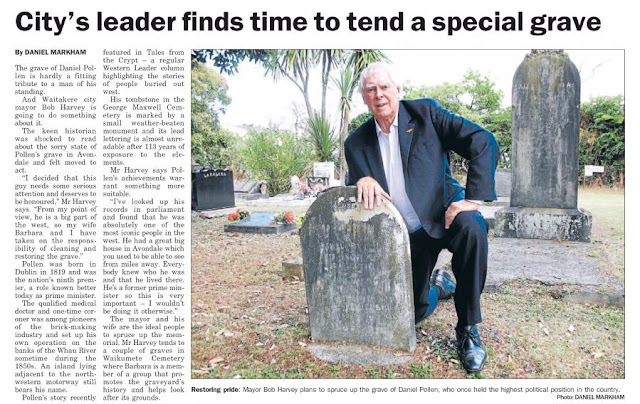 The Western Leader of 15 April had him on the front page, posing beside Daniel Pollen's grave, promising part of his Mayoral Fund to see Pollen was properly recognised, even though Rosebank wasn't part of his city (we're across the Whau Creek from him). Avondale Community Board got stirred up, so -- I took the opportunity of suggesting that, seeing as the cemtery had hit the press, how about that old sign proposal from 2003, eh? Some more suggestions, gentle nudges, I did up some text from Avondale-Waterview Historical Society records, some of my stuff on the cemetery dating back to 2001 ... and here we have it. The sign is on the Orchard Street side, just by the entrance gate. The artwork for the AWHS logo above, by the way, was by my good friend Liz, now known for her Mad Bush Farm blog. So, there's the work of two Kiwi bloggers on the sign. Thank you, Bob Harvey, for speaking up for Pollen's grave. At last, we have our sign! This has made my day..fantastic. Lisa thanks for the mention on the Logo I still remember doing that on that A4 drawing paper and carefully inking it. It looks amazing along with the sign. Way to go!